Ever wondered what's the greatest Hammers song? Better still, ever wondered why the Cockney Rejects version of Bubbles isn't played at the Boleyn ground on match days? It would certainly seem to make sense as their version released as a single in 1980 is a right stonker. 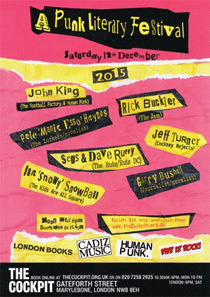 If you keep you eyes open you can sometimes pick up a stray copy but now you can go on step further and catch lead singer Jeff Turner speaking at a punk literary festival on Saturday 12th December at the Cockpit Theatre on Gateforth Street (Nr Edgware Rd Tube). The event includes an impressive line up of speakers that also includes Rick Buckler (The Jam), Garry Bushell(Grandfather of Oi), Segs & Dave Ruffy (The Ruts), Pete 'Manic Esso' Haynes (The Lurkers), Ian Snowball (Medway Punk) and headlining John King (Football factory, Headhunters, England away). It promises to be a great day, kicking off at noon and running until 6pm. Tickets are a very reasonable £15. It is sponsored by Human Punk, Cadiz Music, London Books and the splendid Vive Le Rock, whose editor Eugene Butcher will be conducting the interviews. Tickets are available at: www.thecockpit.org.uk/show/a_punk_literary_festival.